Ferens Art Gallery is one of the UK’s finest regional museums. Opened in 1927, the gallery was gifted to the city by T.R. Ferens, a local industrialist who established a purchasing fund that has allowed its permanent collection to grow in quality and range. Today this includes works by Canaletto, Frans Hals, Henry Moore, and David Hockney. As part of Hull City Council’s £80m cultural capital programme, and in preparation for Hull’s term as UK City of Culture 2017, Ferens Art Gallery closed in September 2015 to allow a £4.5m renovation project to take place. This study day provided an exciting opportunity to explore the redisplayed permanent collection soon after the gallery’s reopening, and in particular to view the special in-focus exhibition which features as its highlight the rare early Sienese gold-ground painting by Pietro Lorenzetti, ‘Christ between Saints Paul and Peter’ of about 1320. The day commenced with an introduction from Kirsten Simister, Curator of Art at Ferens Art Gallery. Kirsten spoke about the benefits to the gallery of Hull’s award as City of Culture, which has seen around 200,000 visits to the gallery since its reopening in January 2017, representing ten times the number of visits counted during equivalent periods in previous years. Kirsten also discussed the history of the acquisition and conservation of the Lorenzetti panel, explaining how increased cultural engagement in the city has allowed the Ferens team to maximise the public benefit of the purchase. Kirsten elaborated on the details of the Ferens refurbishment project which involved a full decant of the displays and stores, and an upgrade of the buildings management systems, alongside the planning, funding, and delivery of an engagement programme to complement the new galleries. Looked ahead to the future of the gallery over the next few years, and the legacy of the Year of Culture, Kirsten emphasised that partnerships will be crucial to the Ferens’ continued success. Caroline Campbell, The Jacob Rothschild Head of the Curatorial Department at the National Gallery, said a few words about the partnership between the two institutions, and enthused about the benefits of working on such an exciting project with the dynamic team at the Ferens. Caroline explained the role played by the National Gallery in the project, including details of the conservation of the Lorenzetti panel undertaken in London, and the loan of four works from the National Gallery collection which provided a wider context for the Lorenzetti panel in the spotlight exhibition Pietro Lorenzetti: Siena to Hull, A Masterpiece Revealed which was central to the relaunch of the gallery. The group then enjoyed a lecture from Lucy West, The National Gallery Curatorial Trainee with Art Fund support and the assistance of the Vivmar Foundation, who has been based at the Ferens Art Gallery over the last year, and who has been working on the redisplay of Old Masters in the collection and carrying out research into the Lorenzetti panel. Lucy based her research on training she received at the National Gallery at the beginning of her traineeship; resources in the curatorial archives and research centre at the gallery; and a research trip to Arezzo, Siena, and Assisi, through which she was able to experience first-hand church interiors where this type of panel would have been displayed, and to see similar works in situ. 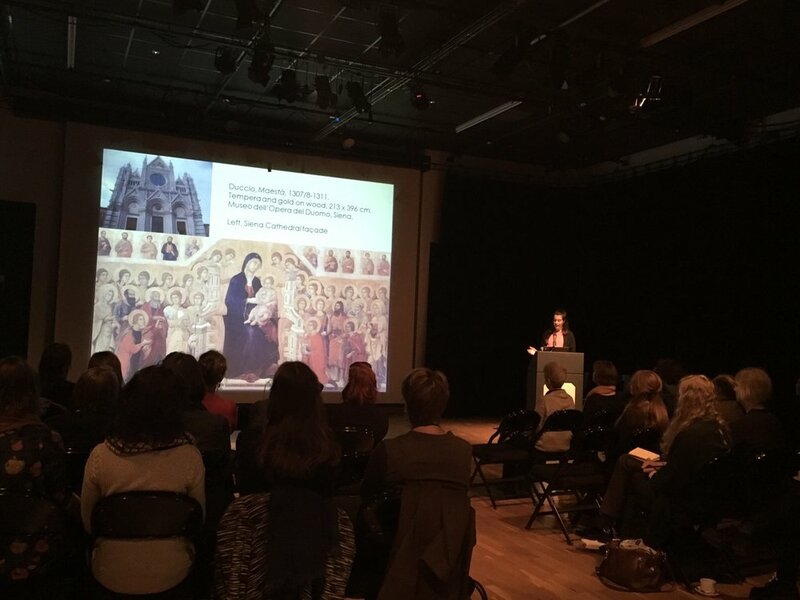 Lucy went on to discuss how her research culminated in the special exhibition: creating a context for the Lorenzetti painting and using loans from other institutions to enable visitors to navigate the work’s highly original style as well as encapsulating a flourishing period in Sienese art. With this in mind, Lucy considered the place the panel will occupy amongst the Ferens’ collection after the exhibition closes on 23 April 2017. She will be working on the new permanent display of the Lorenzetti, which will be placed alongside Italian renaissance works. Lucy also explored some of the practical considerations she encountered while planning the display of the panel, including lighting and use of labels. Kirsten Simister then led the group on a tour of the gallery, beginning with a visit to the Lorenzetti exhibition, and then through the rest of the permanent collection, focussing on the Netherlandish and Eighteenth Century Europe galleries. After lunch, we heard from the Heritage Learning team, who work across all of Hull Museums as well as other independent museums and historic houses. The team undertook research into existing and new audiences at the Ferens Art Gallery and worked in collaboration with curators to develop an interpretation plan which would enhance visitors’ understanding and enjoyment of the Lorenzetti acquisition. At the end of the day there was a lively discussion session during which delegates discussed the challenges of engaging audiences with an early Renaissance work which depicts a religious subject matter; and how education and community groups have responded to the new gallery spaces. The Subject Specialist Network: European Paintings pre-1900 would like to extend their heartfelt thanks to all the staff at the Ferens Art Gallery for welcoming the members and showcasing their exciting achievements. We look forward to hearing about continuing developments at the gallery throughout the Year of Culture.